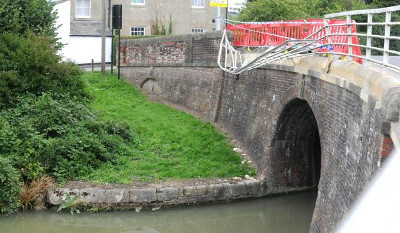 ONCE again Prison Bridge over the Kennet & Avon Canal in Devizes has been damaged and closed the waterway. IT WAS in the early hours of Wednesday morning that a car took out the railings of Prison Bridge (142) above Caen Hill Flight in Devizes, closing both the flight and the waterway from lock 22 to 50, Keith Gudgin tells us. Alan Tilbury reports that this was the second smash this year, the earlier one causing the death of 21 years old Karly Heweson at the same place after her car hit the steel railings in late August. This time the driver that again destroyed the railings escaped injury and left the car, a blue Mercedes C250, but was easily traced by the police the following morning and has been interviewed. After the death at the bridge of Karly Heweson, local councillors called for action to be taken to make the bridge more safe for vehicles, but nothing had been done, the railings simply repaired, and that has only just been completed. There have now been two fatalities at Prison Bridge, the first back in 2012 when Stuart Hughes, aged 25, lost his life when his car struck the bridge at high speed. David Williams writes of just a couple of small (but important) corrections to the story on the latest incident on Prison Bridge. Karly Heweson was a passenger, in the back seat of the car, when she died at the bridge in August. And, to my knowledge, there have been three recent fatalities at Prison Bridge. In addition to Karly and Stuart Hughes, whom you mentioned, Charlie Sherman died in July 2014, when his motorbike collided with a bus on the bridge.